The PTC900 series has been discontinued. Please see the PTC-20 Series as a possible alternative or contact our sales department. The PTC900 timer and PTC901 clock/timer offer many features and performance capabilities that suit a wide range of industrial applications. Both can function as an elapsed timer or preset timer, while the PTC901 also offers real-time clock with date capability. The Plug-in option cards allow the user to configure the meter for the present application, while providing easy upgrades for future needs. Both models can function as an elapsedtime indicator. By using 2 separate signal inputs and 23 selectable timer ranges, the meters can be programmed to meet most any timing application. With the addition of a plug-in setpoint output card, they can easily become a dual or quad output preset timer. The PTC901 can also operate as a realtime clock with the real-time clock card already installed. The meters are capable of displaying time in 12- or 24-hour time formats. The 12-hour format can be displayed in hours and minutes, with or without an am/pm indication or in hours, minutes, and seconds. The 24-hour format can be displayed in hours and minutes or in hours, minutes, and seconds. 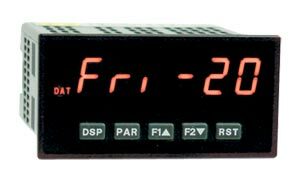 The PTC901 also has a calendar display in which the day, month and/or year can be displayed. The meter will recognize leap years, and can automatically adjust for Daylight Savings time. If the application calls simultaneously for a preset timer and a real-time clock, the PTC901 can handle this requirement as well. A battery-backed real-time clock plug-in card is provided with the PTC901. This card, which includes a lithium coin-cell battery, will maintain the time and date when main power is removed. The meters accept inputs from a variety of sources, including switch contacts and outputs from CMOS or TTL circuits. The input can be configured to trigger on the edge or level of the incoming pulse. Internal jumpers are available for selecting sinking inputs (active-low) or sourcing inputs (active-high). The front panel keys and three user inputs are programmable to perform various meter functions. The meters can have up to 4 setpoint outputs, determined by the optional plug-in cards. The setpoint plug-in cards provide dual form “C” relays (5A), quad form “A” relays (3A) or either quad-sinking or quad-sourcing open collector logic outputs. The outputs can be assigned to the timer, counter, RTC date, and RTC time. The outputs can also be independently configured to suit a variety of control and alarm requirements. Plug-in cards can also provide serial communications. These include RS232, RS485 and MODBUS. Display values, setpoint alarm values and setpoint states can be controlled through serial communications. Once the meters have been initially configured, the parameter list may be locked out from further modification entirely, or the setpoint, timer start/stop values, counter start/stop values, RTC time “set”, and display intensity can be made accessible. Lockouts are activated through a security code or user input. Note: Adding option cards—meters can be fitted with up to 2 optional plug-in cards, however, only 1 card from each function type can be installed at a time. The function types include setpoint alarms and communications. The cards can be installed initially or at a later date. Each optional plug-in card is shipped with installation and programming instructions.